The new standard, which will improve everyone’s quality of life! You are here:Home » Blog » The new standard, which will improve everyone’s quality of life! This year will be marked by a revolutionary new for the construction industry: the NBR 15575 new standard! This standard, called “Housing Performance”, was approved in February and will be published in July. The standard will bring new requirements and prerequisites to transform our current scenario, adding quality and best performance for the next properties to be built. This standard applies to the minimum performance level, but we will also have the intermediate and superior level, which will be optional for projects. From now on the consumers have their rights and they will finally have comfort and security. The most frequently reported problems: noise from the floor/ceiling of neighbors, no soundproof in the dorms, noisy toilet and windows and doors that do not isolate outside noises from the streets. Good news for consumers: the new standard requires a minimum performance for sound reduction, using coatings, windows and doors with superior quality and better hydro-sanitary installations. The structures were becoming lighter, thinner walls, windows and doors without quality. The result? People began to suffer and have problems in executing their activities (sleeping, leisure, concentration, etc.) due to noise. And finally the standard will require an awareness of the sector. 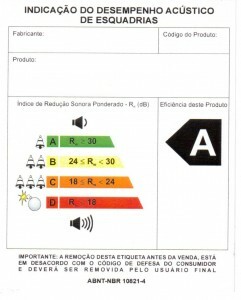 Speaking about sound reduction, have you ever analyzed your windows? Those windows which have two aluminum sheets and a single sheet of glass will not be accepted anymore, their acoustical performance is unfortunate and it is impossible to achieve 100% of natural light, since one half is always closed. Glass is an excellent acoustic attenuator due to its mass, but the weak point however is the frame or the perimeter surrounding the glass, which is not a problem if the entire system has good quality. Due to the new standard, consumers will know the acoustic performance level of their windows (minimum, intermediate and superior). 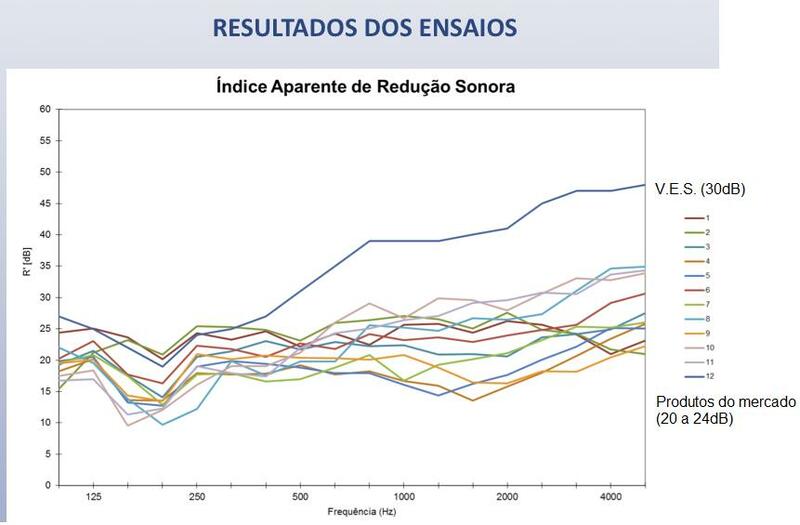 This graph shows the difference of the tests made in the Atenua Som laboratory, between the V.E.S. windows (our own technology, called “Silicone Encapsulated Glass” ) and the other market products. The standard motivates people to always require the best, it is not only about the technical performance of buildings, but also the improvement of everyone’s quality of life, which involves well-being and health. Consequently, architects, engineers and also consumers should care about the environmental comfort, which can be understood by the adequacy of the physical environment alongside human input, improving the ventilation, thermal, acoustic, and light conditions of buildings. The acoustic performance is not visible to the eyes, but it should be considered in all the projects. Everyone needs to be able to work and rest. It depends on us as individuals to make decisions that enable us to live a better and happier life.